San Francisco (Obama.net)- With the passage of his small business plan last week and the signing of it this week, President Barack Obama and his administration are steadily getting their economic goals taken care of. With the implementation of another one of his economic measures, Obama is moving the United States in the direction of reduced unemployment and a recovery from the recession. But some Americans are still not completely sold on the President’s ideas and plans. To inform the American public of the details of his work, Obama took to the road on Wednesday. 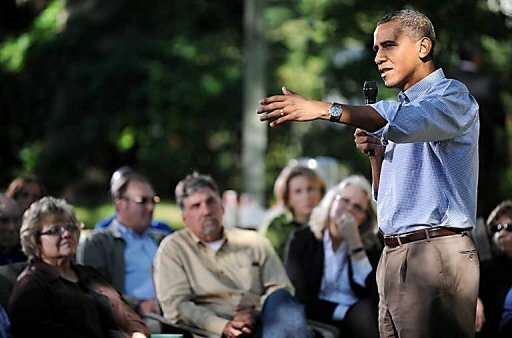 Obama came to Des Moines, Iowa and spoke with families in the area. Among the topics of discussion were the unemployment rate, health care reform, the price of the military efforts in the Middle East, and the debate over tax cuts to the wealthy. Obama made it very clear to his listeners that his measures would in fact progress the American economy and that the children of tomorrow will have a positive life. The President then called on the people of America to work together for the better of the future and that a combined effort by all American’s would result in that better future. Later on in the day, the President of the United States stopped in Richmond, Virginia to deliver a similar message and hear the concerns and comments of the citizens there. Tuesday, Obama went to New Mexico and echoed the message that he has been giving all summer. He told them that come November 2nd, the people of America would have to choose between the Republican policies that got us into this economic crisis, and the Democratic policies that have been bring us out of the crisis for the last two years. During his speeches, Obama explained the facets of the health care reform that benefit the youth of America, as well as those that benefit the elderly of the state. Obama also spoke negatively about the lack of new ideas by the Republicans Party in addition to their desire to extend the Bush era tax cuts to those making over $250,000 a year, which would cost the American government $700 billion. Obama made it clear that the measures the Republicans want to take are too costly for the American government and the American people right now. As Obama said, 98% of the population shouldn’t suffer just so 2% can hold onto a little extra money.